Laundry Hamper, Buy Clothes Hamper, Nurses Hamper, 214-S, 214-S-FP, 214-D-FP. PVC Single Bag Hampers from MJM are handy, durable hampers. Makers of other hygienic medical grade products such as shower commode chairs, MJM is a leader in the industry. 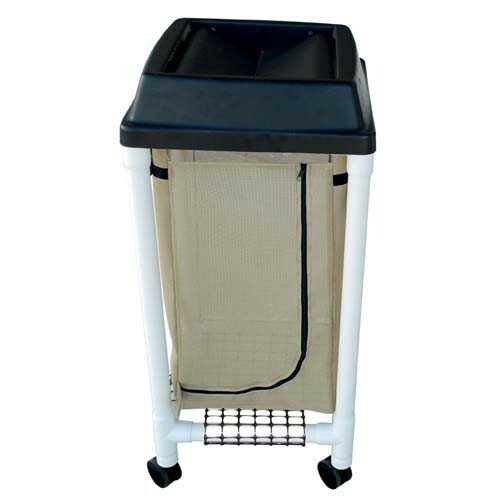 This hamper is over three feet tall and has a 14.46 gallon capacity. The hamper lid comes with rubber bumper pads to reduce banging noises. The mesh is breathable, flame-resistant, mildew resistant and has high tear and tensile strength. The medical grade PVC polymer plastic frame inhibits bacteria growth for sanitation and easy cleaning. Patients and caregivers will also find the hamper easy to transport with a built-in handle.